How to make a perfect Calorie and Exercise Chart?? Download this Calorie and Exercise Chart template now!! There are two main factors that contribute to weight loss, Calories and Exercise. One of the hardest obstacles to overcome in losing weight is monitoring the amount of calories you eat and burn in a day. By keeping track of your daily snacking, you can see where and how this will influence your weight goals. This chart tracks both your calories and your workout, so you can quickly adapt to any changes in your busy schedule. The first table designed to outline your goals, and how you’re progressing through the week. The first tab illustrates the amount of calories you burned and an analysis of your fiber, sugar, carb, and calorie intake. Exercise is a key element too, so the bottom graph of the template is there to encourage your exercising habits. The second tab helps you to chart your macros to help increase or reduce the amount you eat accordingly. Simply input the date and time, fill out the columns marked with calories, carbs, sugars, and fiber, and leave a note for yourself so you know what meal of the day it was for. 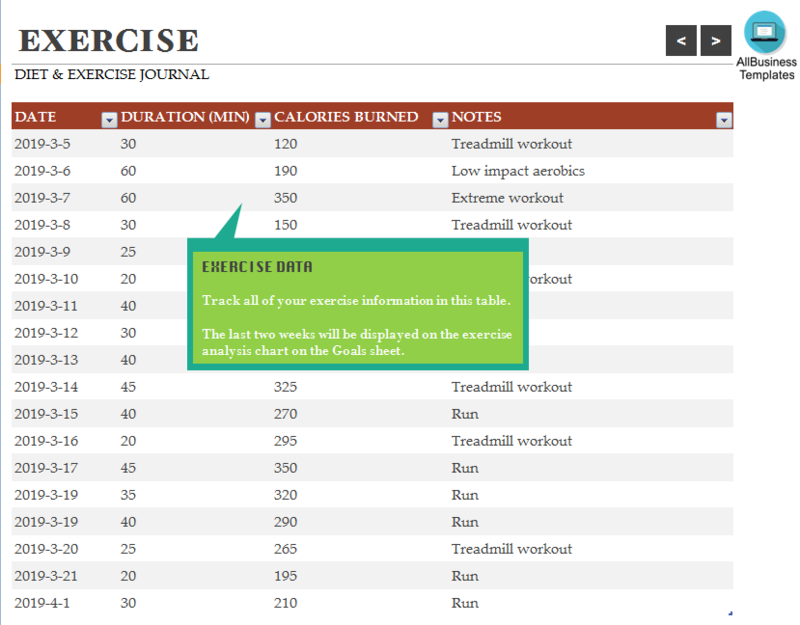 The “Exercise” tab works in much the same way as the “Diet” tab, just fill out the your exercise, the amount of calories you burned and watch as the graph on the “Goals” tab calculates your total caloric burn for the week. How does the calorie chart help you? By monitoring your calories and exercise, you can view and adjust your eating and exercise habits to achieve the fastest results for your weight loss goals. Everyone has fitness goals, whether you want to look good or simply be healthy, the caloric calendar takes the guess work out of your calorie consumption and gives you an accurate way to monitor your progress.